Sharoni has a Rollins' sound, albeit not quite as abrasive, that enables him to wander back and forward in time. It's bebop for today and it swings enough to repel any boarders from "The Outside". Think Blue Note - it's no coincidence that, among Sharoni's originals are Freddie Hubbard's Down Under; Leo Morgan's Ceora (sumptuous, like strawberries and cream on a summer's day) and Ray Bryant's Tonk a number that launches Rotondi into a solo that hits the button without losing its lyricism. Needless to say Barbato and Sharoni are in there pitching. Listening to the originals, and they really are originals, makes me wonder why they aren't playing festivals and clubs all over the world! My worthy constituent Russell informs me that The Bodega, a bar in Newcastle, serves the finest pint of Prince Bishop Ale in town. By coincidence, one of Sharoni's compositions is titled The Bodega! and, take it from me that if the beer is as good as this track, then it will indeed be Nectar +! 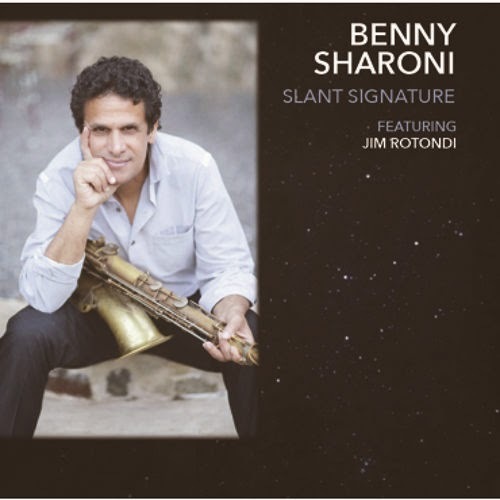 As a matter of interest - particularly to sax players - the title of the CD Slant Signature relates to a much sort after Otto Link hard rubber mouthpiece from the 1940s which, if you can find one, might set you back a $1000. Sharoni got one for 10 bucks off a street vendor on Cape Cod!